In my previous post on the origin of phylogenetic networks, I considered the idea that the earliest published one was the genealogical network of races of dogs produced in 1755 by Georges-Louis Leclerc, comte de Buffon. If we accept that idea, then the next such genealogy published was the genealogical network of species and cultivars of strawberries ("Généalogie des Fraisiers") produced in 1766 by Antoine Nicolas Duchesne (1747-1827). Like Buffon, Duchesne was a remarkable man in many ways. From a scientific perspective he was a child prodigy. In 1764, while 16 years old, he published his first professional book: "Manuel de Botanique, contenant les Propriétés des Plantes utiles" (Didot le jeune & C.J. Panckoucke, Paris). This manual described the nutritional, medical, artistic, and ornamental uses of the plants cultivated around Paris, and also provided standardized common names. The work is particularly important for botanical systematists, because it contains the first publication of Bernard de Jussieu's "natural system" of plant classification, the only one that appeared during de Jussieu's lifetime (the next version was published by Antoine Laurent de Jussieu in 1789) (see Stevens 1994). Duchesne's father was Superintendent of the King's Buildings, giving his son access to the various royal gardens. 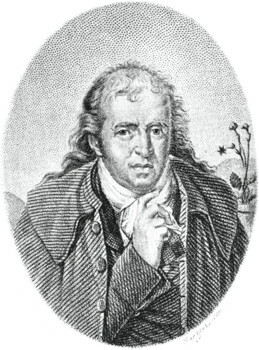 Bernard de Jussieu, Sub-demonstrator of Plants at the Jardin du Roi (at Versailles), was his mentor, so that Duchesne grew up in a distinctly botanical environment, probably knowing as a teenager more first hand about the natural history of cultivated plants than most people acquire in a lifetime. Unfortunately, as a scientist Duchesne did not live up to his early potential. He continued to work and publish sporadically within the field of horticulture, but did nothing particularly distinguished. He inherited his father's post, but this was abolished after the French Revolution, so that he lost touch with the nobility. Perhaps he was also influenced by Bernard de Jussieu's almost completely self-effacing nature, and thus did not seek recognition — his first book on strawberries (see below), for example, was officially written by "M. Duchesne fils" ("Mr Duchesne's son"). Today, we can appreciate his attention to scientific detail with the recent publication of two books of his immaculate illustrations (Staudt 2003, Paris 2007; see also Paris 2000), which were prepared for his publications but were not published — Duchesne could not afford to pay for their inclusion in his printed works. Duchesne first presented his work on strawberries in 1764, at the age of 17. This consisted of the first-hand observation (in 1763-64) of the origin of a new cultivar, capable of persisting from its own seeds. This is a remarkable story in its own right (see Lee 1964, 1966), but it's importance for us is that Duchesne became convinced of the non-fixity of varieties and species, and then contemplated the idea that all strawberries came from a single progenitor: "The formation of this new race of strawberry plants must render the hypothesis that all descend originally from a single one more than probable" (pp. 133-134 of the book cited below). Duchesne was encouraged to continue his studies, by Carl von Linné among others (Hylander 1945). This culminated in 1766 in the publication of the work of interest to us here: "Histoire naturelle des fraisiers, contenant Les vues d'Économie réunies à la Botanique; et suivie de Remarques Particulières sur plusieurs points qui ont rapport à l'Histoire naturelle générale" (Didot le jeune & C.J. Panckoucke, Paris), available for viewing online at Google Books. The illustration shown here faces page 228, and summarizes Duchesne's textual description on pages 219-228. It is, as noted by its title, explicitly a diagrammatic genealogy of strawberries; and on pages 223-224 relationships between strawberries are described as being like those between different branches of the same "house" (i.e. the genealogy of a human family). Like Buffon's diagram the root is at the top, and reticulating relationships are clearly distinguished from bifurcating ones, although wiggly lines are used rather than dashed ones. Equally importantly, Duchesne distinguishes varieties (in dashed boxes) from species (in solid boxes). The new cultivar that he had observed is indicated as "La Race nouvelle". Duchesne's evolutionary intent is made clear in his text: "I consider the alpine, Fraisier des mois I [Fragaria vesca semperflorens, the everbearing strawberry] as the father of all the others. It is also at the head of the tree. The common wood strawberry, Fraisier de bois II [F. vesca sylvestris, the wood strawberry] which differs almost solely in its slower rate of growth, is immediately below, as if produced by it." For each of the ten species and nine varieties of strawberry he tries to trace the history of its European introduction, cultivation and distribution, using this information to indicate what he thought to be the oldest and the newest species, thus suggesting which kinds might have descended from which others. The order in which he discusses each species follows this system. Thus, the diploid F. vesca kinds are followed by the hexaploid F. moschata and finally by the octoploid American kinds (F. virginiana and F. chiloensis). As with Buffon's work, this arrangement is almost entirely supported by modern genetic studies (see Hummer et al. 2011), thus emphasizing the extraordinary intuitive insight involved in this early work. Duchesne's thoughts on evolution in general are contained in the Appendix constituting the "Remarques Particulières", notably pages 11-21. He was particularly concerned about the possible distinction between species ("espèce") and variety ("race"). "It is certain today that, if all species are stable, there are also races whose distinctions are constant, although belonging to the same species. The Versailles strawberry that I saw born, and which became the head of a race, puts that fact beyond doubt. Cultivation and other accidental causes do not produce new species, but changes in certain individuals do occur that are perpetuated in their posterity, constituting new races." Like Buffon's work, Duchesne's evolutionary ideas seems to have aroused no especial long-lasting interest among his colleagues, although his book received an honourable commendation when presented to the Académie des sciences (not bad for a 19-year-old). Duchesne further continued his work on strawberries. He contributed the unillustrated article on "Fraisier" to the "Encyclopédie Méthodique. Botanique" edited by Jean Baptiste Lamarck, published on pages 527-540 of part 2 of volume 2 (1788; C.J. Panckoucke, Paris). This has 25 named (and numbered) taxa of strawberries, and Duchesne also rearranged his classification system. At the same time (or perhaps earlier, in 1770 or 1771) he published a separate book that appears to be a fuller 46-page version of the encyclopaedia article: "Essai sur l'histoire naturelle des fraisiers". I have not seen this work, but a contemporary review (Journal de médecine, chirurgie, pharmacie, etc. [sic!] 1788, 74:373-375) describes it as starting with a quotation from Linné's encouraging letter to the young Duchesne, and then saying a lot more about each taxon, with "vingt-sept espèces ou plutôt variétés". There is no mention of a network diagram. Duchesne has also been noted as publishing at least two later works on strawberries, neither of which I have seen: "Sur le fraisier de Versailles" (Journ. Hist. Nat. de Lamarck II pp. 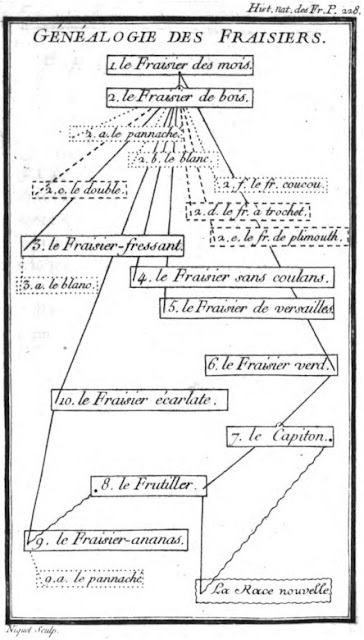 343-347; 1792); and "Fraisier" du Cours d'Agriculture de Deterville (VI. p. 129-189; 1809). Anyway, Duchesne's own interpretation of his diagram as a hybridization network is abundantly clear. Moreover, it is a network of species as well as races although, like Buffon, the author stops short of suggesting that species themselves can hybridize. Hummer K.E., Bassil N., Njuguna W. (2011) Fragaria. In: C. Kole (ed.) Wild Crop Relatives: Genomic and Breeding Resources: Temperate Fruits. Springer-Verlag, Berlin. Hylander, N. (1945) Linné, Duchesne och smultronen. Svenska Linné-Sallskapets Årsskrift 28: 17-40. Lee V. (1964) Antoine Nicolas Duchesne — first strawberry hybridist. American Horticultural Magazine 43: 80-88. Lee, D.V. (1966) Duchesne and his work. In: G.M. Darrow (ed.) The Strawberry: History, Breeding and Physiology. Holt, Rinehart & Winston. Paris H.S. (2000) Paintings (1769-1774) by A.N. Duchesne and the history of Cucurbita pepo. Annals of Botany 85: 815-830. Paris H.S. (2007) Les dessins d'Antoine Nicolas Duchesne pour son histoire naturelle des courges. Publications scientifiques du Muséum national d'histoire naturelle, Paris. Staudt G. (2003) Les dessins d'Antoine Nicolas Duchesne pour son histoire naturelles des fraisiers. Publications scientifiques du Muséum national d'histoire naturelle, Paris.